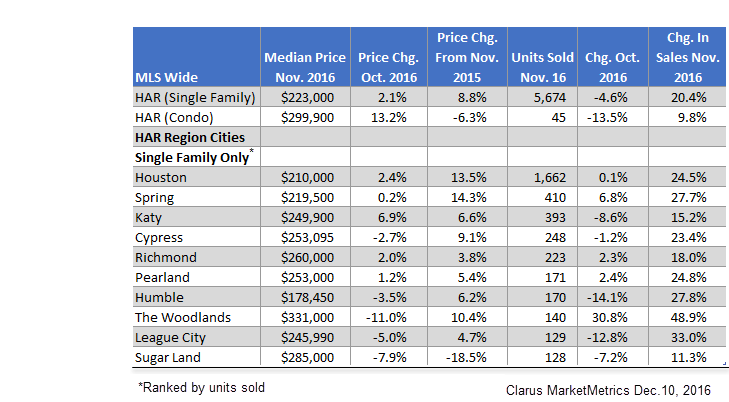 HOUSTON - November 2016 housing statistics have been released by Houston Association of Realtors (HAR). Clarus MarketMetrics provided the data. The data compares price changes and sales changes from the previous month and the previous year for Houston area single-family homes. The report also includes the median price and number of units sold in November 2016. •The median price of existing single-family homes increased to $223,000 up 2.1% vs Oct-16. •Existing single-family home sales decreased 4.6% from Oct-16 for a Nov-16 total of 5,674 sold units. •Condos increased in price to $299,900 up 13.2% vs Oct-16. •Existing condo sales decreased 13.5% in Nov-16 over Oct-16 for a total of 45 sold units. ​​Need more data? See Houston Housing Market Research.​ If the Center does not have what you think is imporant, please send it to us for publication.